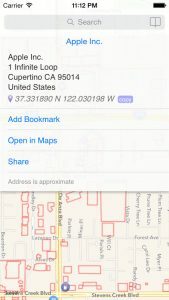 New sharing feature allows to share links to specific place or location. Will share a link to open WikiPlaces application as well as a link to Wikimapia or mapping website for devices without WikiPlaces installed. Of course it's also possible to manually compose links utilising the new wikiplaces:// scheme. 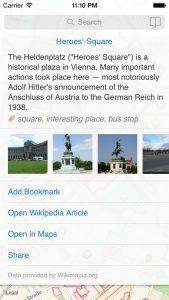 Bookmarks improved with ability to rename existing bookmarks and specify custom name when adding bookmarks, and with support for bookmarking arbitrary map locations as well as Wikimapia places. New details view is available for arbitrary map locations (ie., when you long-touch any point on the map) with options to view address, copy coordinates, add bookmark and share - just as for Wikimapia places. 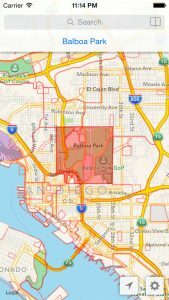 Other changes include improved user interface, especially on iPad, ability to navigate to Wikimapia place by specifying its ID in the search field, and various bug fixes.